Old-fashioned Web hosting companies (ex., 1&1, Interland, Verio, Yahoo!, AOL) provide storage space on a hard disk and the necessary bandwidth. They may even throw in a few tools. 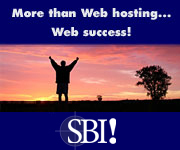 Their goal is to sell you on the idea of putting up a Web site cheap, quick, easy. Then you spend the next years (and plenty more dollars) struggling to get found by the Search Engines.